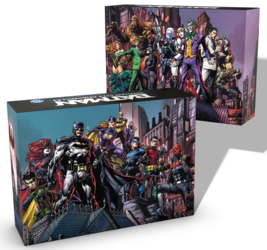 Batman(TM): Gotham City Chronicles is a miniature board game in which 2 to 4 players control the Black Knight and his allies in storyline battles, using an open and asymmetric game system. Each part is done within the framework of a scenario in which two sides confront each other in a conflict full of action. One of the players embodies the villain and controls the most infamous criminals in Gotham City. The other players take control of the heroes, who must work as a team to thwart the villain's plans. Each side plays in turn, hoping that its strategy will allow it to achieve the objectives set by the scenario. Each Batman game therefore follows a scenario that defines the atmosphere, context, location of the action, the setting up of the game, the number of rounds and the specific objectives of each side, which must be achieved in order to win. The game features two opposing sides: the heroes and the villain. We wanted to highlight this dynamic as soon as you see the boxes. Yes, "the boxes", because one box will not be enough to hold everything you will have. This separation into two boxes has another significant advantage: the installation of a part is made easier. The hero box contains the heroes' trays, screens, cards... everything they need to play. The villain's box contains the miniatures, tiles, dice and everything needed to prepare the command centre and the upcoming battle. Batman: Gotham City Chronicles was funded on the Crowdfunding Kickstarter (See the campaign) platform on the 31 March 2018, the campaign lasted 31 days. 19,303 people helped funded the game, whose the amount requested was $500,000.00. Thanks to these 19,303 people the game could be funded up to $4,403,197.73, ~880.64%.